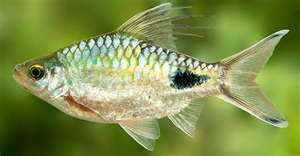 Sri Lankan scientists have discovered a new genus of freshwater fish and named them Dawkinsia after the world renown evolutionary scientist and aethist, who wrote the popular book, God Delusion. According to Lead researcher Rohan Pethiyagoda the new genus, comprises nine species that are found only in South Asia and are characterised by long filaments that trail from the dorsal fins of males. The fish has previously been classified under the genus Puntius, comprising around 120 species of small tropical fish known as barbs. A report said “Pethiyagoda, an ichthyologist and internationally acclaimed conservationist, said extensive studies in India and Sri Lanka showed that the level of diversity among such fish was “much greater than previously suspected”. “This was partly the reason that the study group had chosen to name the new genus after the 71-year-old Dawkins, the British author of the anti-religion polemic, The God Delusion. “Richard Dawkins has through his writings helped us understand that the universe is far more beautiful and awe-inspiring than any religion has imagined,” Pethiyagoda told a news gency. Male Dawkinsia barbs advertise their fitness by growing long fin filaments that make them more attractive to females but also dangerously conspicuous to predators. “The filaments are rather like the peacock’s tail, expensive ornaments that place their owner at greater risk while offering him the reward of being the preferred choice of females,” Pethiyagoda said. The genus reclassification followed an eight-year study of the DNA, bone structures and overall anatomy of Puntius species. There should be a local name for this as villagers knew similar groups of fish by name. It looks like “Pethiya” that we knew.